5/14 Cup of Coffee: Greenville's flair for the dramatic led to the only affiliate victory on Tuesday. Pawtucket fell victim to a shaky start and mother nature while Portland and Salem were quiet at the plate. Pawtucket could not overcome an early 6-0 deficit and the elements as they fell to the Indianapolis Indians (PIT), 6-2 in six innings. PawSox starter Rubby De La Rosa had a difficult evening on the mound, allowing six runs on six hits and four walks, striking out four in just three innings of work. Chris Hernandez pitched well in relief, allowing just two hits in 2 1/3 innings. The Indians plated three runs in both the first and second innings to put Pawtucket into a 6-0 hole. In the third, the PawSox would get a run back as Alex Hassan scored on a fielding error by the Indians right fielder. Brock Holt's RBI single in the fourth accounted for Pawtucket's only other run of the contest, as the team went 2 for 10 with runners in scoring position. The game was called with one out in the bottom of the sixth due to rain. Holt and Christian Vazquez each had two hits to lead the PawSox offense. Despite outhitting their opponent, Portland was doubled up by the New Britain Rock Cats (MIN), 4-2. Mike Augliera fell to 2-4 after allowing four runs on seven hits and a walk in seven innings of work. Miguel Celestino added a perfect inning of relief, striking out two. The Sea Dogs took an early 2-0 lead in the second, thanks to a solo home run from Blake Swihart and an RBI single off the bat of Mookie Betts. The Rock Cats immediately cut the lead in half in the bottom of the second, and scored two in the fourth and one in the sixth to secure the victory. Portland was unable to cash in on multiple scoring chances, going 1 for 12 with runners in scoring position and leaving 11 men on base. Betts was 2 for 4 with a double, walk, RBI and two stolen bases. Swihart was 2 for 3 with a walk, solo home run and a stolen base. A quiet night at the plate and some costly defensive lapses allowed the Wilmington Blue Rocks (KC) to take down Salem, 4-1. Cody Kukuk received the start and tossed just 2 2/3 innings, allowing three runs (one earned) on three hits and three walks, punching out a trio. Madison Younginer pitched well in relief, allowing just two hits and a walk in 3 1/3 innings of work. The game was scoreless until the third, when the Blue Rocks plated three runs, aided by a key fielding error by Red Sox center fielder Aneury Tavarez, his second of the contest. Salem's lone run came in the sixth, thanks to an RBI single off the bat of Ryan Dent. Salem had just three runners in scoring position the entire evening and struck out nine times against stellar Wilmington pitching. In one of the most exciting games of the season, Greenville used a five-run bottom of the ninth comeback to knock out the West Virginia Power (PIT), 7-5. Ty Buttrey took the hill for the Drive, allowing one run on three hits and three walks in 4 2/3 innings. Raynel Velette struggled in his three innings of relief, allowing four runs on five hits and two walks, striking out two. Greenville took a 2-0 lead in the fourth on a Wendell Rijo two-run home run. The Power would score a run in the fifth and the eighth as well as three runs in the seventh to take a 5-2 lead to the ninth. In the ninth, Bo Greenwell led off the inning with a single, followed by a Jordan Weems walk. Zach Kapstein walked up to the plate and tied the game with one swing of the bat, blasting a game tying three-run home run. After a Jimmy Rider fly out and a Tzu-Wei Lin walk, Carlos Asuaje (pictured, above) sent the fans home happy with a game ending two-run home run. Player of the Day: Carlos Asuaje, who hit a two-run walk off home run in Greenville's 7-5 victory over the West Virginia Power. The 22-year-old infielder is having a nice season with the Drive, hitting .333/.440/.622 with three home runs, 11 doubles, six triples, and 26 RBI in 31 games. 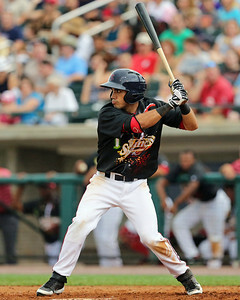 Selected in the eleventh round of the 2013 draft, Asuaje has been especially tough this season with runners in scoring position, hitting .412 with 22 of his 26 RBI. Photo Credit: Carlos Asuaje by Kelly O'Connor.